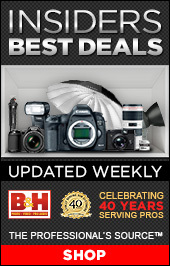 When I decided to do a weekly post about different aircraft, I was having an issue with how to accurately tell the story of certain planes that have very diverse and unique histories. The only conclusion is that with certain aircraft multiple posts would have to be made. 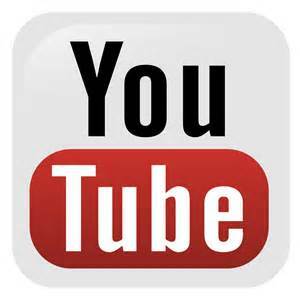 This weeks topic is a great example of the various history that surrounds each variant of the plane and as time goes on the need for more posts that will arise. 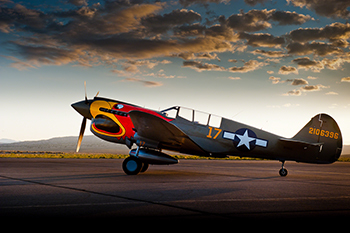 The Curtiss P-40 is one of the few planes that during WWII was not only around from before the start but was also used in every theatre of the war. While it never had the sleek fighting capabilities as many of the later model planes did, it did have the reputation for being rugged. It’s armor plating helped to save many lives. In the British Commonwealth and the Soviet Air Force, B, C and equivalent models were known as the Tomahawk, while D models and later variants were known as the Kittyhawk. In the United States Army Air Force it was known as the Warhawk only after the P-40F variant came out with the Roll Royce Merlin engine installed. The P-40 first flew in 1938 and was produced up to 1944. A step up from the Curtiss P-36 Hawk, over 15,000 ended up being built. Many legends have been built up around the P-40 as most believed it’s fame came from either Pearl Harbor, after Lts. Welch and Taylor destroyed several Japanese planes in them or from Claire Chennault and the American Volunteer Group, also known as the Flying Tigers, fighting in the Burma China Theatre as part of the Chinese Air Force. This isn’t to say that both of those don’t demand notice for their actions, merely it wasn’t the beginning. The first allied air force to use the P-40 in combat was the British in North Africa. They also saw combat in the Middle East before going over to China to fight the Japanese. It was in North Africa that the famous shark jaws were first put onto one of the P-40s after being seen on some of the German twin engine fighters. This example is a P40C model that came out of restoration in 2014 and is currently owned by the Fighter Collection in Duxford. This is one of the earliest examples as not many C models exist. To that point only one P-40B is still flying today, also was once owned by The Fighter Collection, now a part of the Collings Foundation. That particular P-40B was the only surviving P-40B from Pearl Harbor. The P-40C 41-13357(above) was acquired back in the 90’s from the former Soviet Union where most of its history is unknown. It was accepted by the USAAC in 1941 where went to Patterson Field, then Puerto Rico, then back to Buffalo, NY for an overhaul and then on to Russia. The aluminum finish is in honor of a P-40 stationed at Chanute Field, KS where it would’ve been used as a personal ‘hack’ for a base commander. 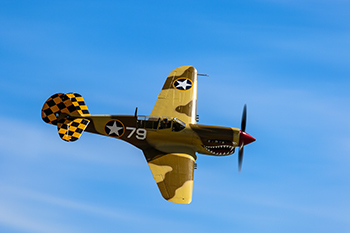 It is one the finest restored P-40s flying. The main dislike of the P-40 was the lack of a two stage supercharger which made it virtually useless as a high altitude fighter. This made it less desirable in Northwest Europe where the BF 109 and FW 190 were more overpowering. Also the P-38, P-47, Spitfire and later the P-51 were much better high performance planes. However the P-40 was still a very useful plane in the other theatre’s where high altitude wasn’t as necessary. Two of the major uses were as an air superiority fighter and a ground attack fighter. It’s low cost augmented some of the issues, which helped it stay in production. Nevertheless not many planes have the history of being flown around the the world. Not only were they used in Europe, North Africa, Southwest Pacific and China but also in Southeast Europe, Italy, Alaska and Southeast Asia. They were also part of the lend lease program so many went to the RAF and Soviet Union. Besides the planes combat history, several were used as trainers and base hoppers in the states. Due to the planes low cost and ease of maintenance many of the P-40s remained on bases for pilots to use to acquire hours in. Like most fighters just aft of the cockpit was an internal fuel tank which when removed leaves enough space for another person. 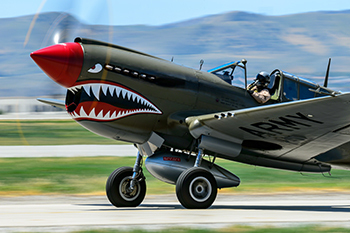 Many P-40s have been modified so that they can give rides today. However some P-40s were specifically built as a trainer with a second seat and a second set of controls. 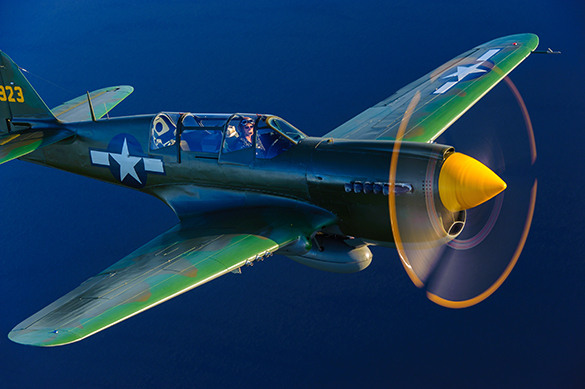 This is the TP-40N one of five designed as a trainer and is part of Fantasy of Flight. With Kermit at the controls, you can see how much space there is behind him for someone in training. Due to the planes unique history spread all over the world, several different markings appear on the planes. In context there are books written solely on these markings and what they mean. While the standard color is Army Olive Drab, the shark jaws is in honor of the AVG, whose planes were infamous for having the design. The red prop hub I believe is a symbol of the RAF. This shot came from the Planes of Fame Airshow in 2014. It is one of the most packed airshows in the United States with dozens of planes in the sky making it something worth seeing. Most P-40s have some sort of olive drab variation, due to the fact that most were stationed in areas where they would be flying over something green. If an enemy plane was looking down on the P-40, then it should blend in more. However, in North Africa olive drab wasn’t very suitable. 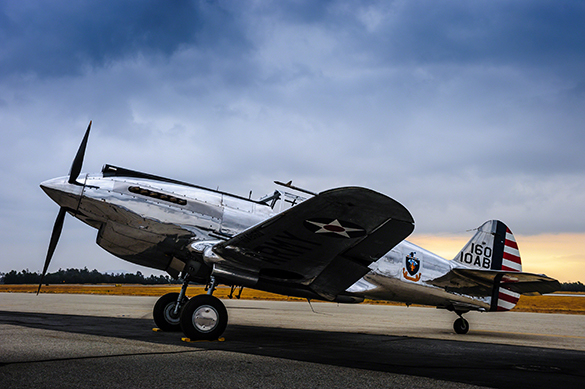 This particular P-40N is part of Planes of Fame and is painted in honor of the 325th Fighter Group out of North Africa. They were known for the yellow and black checkerboard pattern on the tail and thus called the Checkerboard Clan. The shark jaws having first been painted on in North Africa after seeing the markings on German planes are also part of the design. While the Allies in North Africa may have been the first to where the famous jaws, it was the Flying Tigers that made it famous. Among the more unusual of the designs is the “Parrot Head” art work of Warhawk Air Museums P-40N. This particular design started at Napier Fields, Alabama for advanced pilot training. This particular aircraft is in honor of class 43K of Dothan, AL. Like many planes after WWII, there wasn’t much of a need for the P-40. With faster, better fighters on the frontline, the P-40s became rather obsolete with some being sold off to other nations as trainers. In 1964 when the Reno Air Races began there was a call for the planes again beyond that of airshows and museums. With the added classes of bronze and silver, the unlimited category allowed other WWII fighters to compete without having to achieve speeds of that of a Mustang, Bearcat or Hawker Sea Fury, as those are the most prominent winners of the golf category. Warhawk Air Museum is one of the competitors in the other classes that consistently has brought down one of their warhawks for competition over the years. Both Parrot Head and Shark Jaws as they are affectionately known have been seen racing around the pylons. 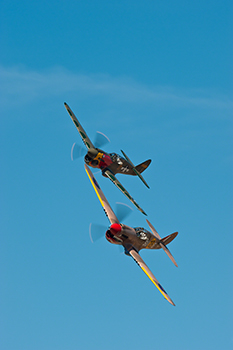 In 2009 both planes were at the races and in a rare moment they stacked up for a brief second. The shutters were going like crazy as everyone wanted the shot of the two warhawks stacked up. The P-40 was known as being rugged. 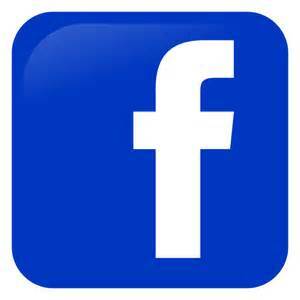 It is seen as the same. 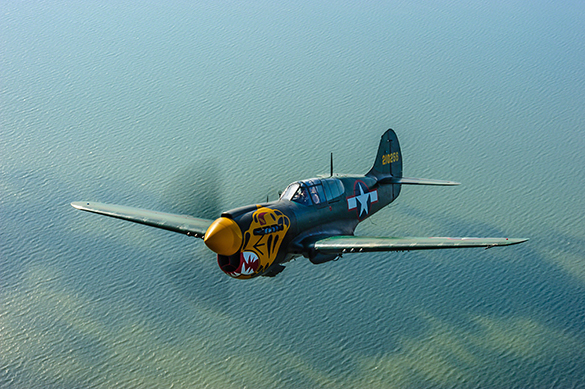 Whether over land or sea the P-40 looks at home in the sky. It’s history spans the length of the globe with stories from rookie pilots to legendary aces like Claire Chennault and Gregory Boyington. Numerous books have been written about the plane and none of them says it all. It’s history grows everyday as more is discovered and more are restored to fly again. There will always be another chapter to this plane.